This use of “art” which is really just a bigoted propaganda campaign to encourage prejudice, paranoia and division in America is part of an overall hate campaign against police which is heavily supported by the Democratic Party. One of the key aspects of this campaign is to generate a new bigotry in America by dehumanizing police. In this case it was by portraying police as pigs not humans and to generate paranoia amongst blacks by trying to convince people that a primary objective of police is to hunt down and murder innocents blacks. 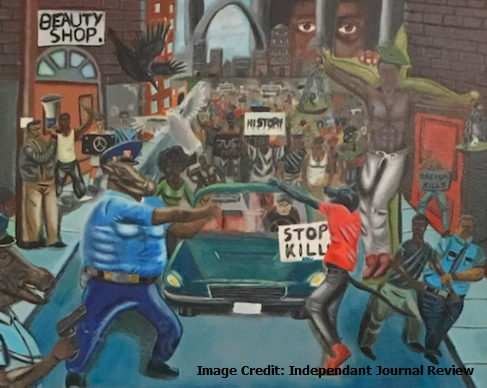 The untitled artwork, which supposedly symbolizes the unrest that followed the fatal shooting of Michael Brown in Ferguson, MO, was selected as part of the annual Congressional Art Competition. It currently hangs in a tunnel between the U.S. Capitol building and Longworth House Office Building. http://ijr.com/2016/12/766256-painting-of-cops-as-pigs-hung-proudly-in-u-s-capitol/ The hate speech is heavily supported by many Democrats, but not by Republicans on Capitol Hill. This is exactly the same strategy that Democrats used to encourage the terrorist lynchings of blacks in the past Democrats would first dehumanize blacks with “art” then made white folks paranoid of blacks so that whites would murder blacks and thus assist the Democrat Party win elections. Likely the most successful political operation Democrats ever did involved using the “art” below to portray blacks as vampires not humans with claws not fingers ripping at white women in North Carolina in 1898 as part of an overall hate and paranoia campaign. This led to the murder of about 50 blacks in one day in a military overthrow of the Wilmington city government. Democrats controlled North Carolina for every election in the next 70 years. Arguable this racist mass murder is the most successful operation the Democratic Party has ever done. Compare the old Democrat hate campaign to the new one above, nothing has changed, just the target of their hate. What is the solution? Generating racist paranoia and riots has benefited the Democratic Party for over 150 years. They will stop doing it when it stops helping them. Appealing to Democrats on the basis of doing whats right and good, has never seemed to work. How can we stop helping the Democrats and hurt them when they spreading bigotry, paranoia and division in America? If police organize an “End The Bigotry” campaign they can scare the Democrats into ending the hate campaign against police. The police do have the power to stop Democrats. If police start a campaign to get police, their families and their supporters to sign pledges they will never vote for a Democrat for the next 20 years because of this bigoted hate campaign against police that will scare silly selfish Democrat politicians. 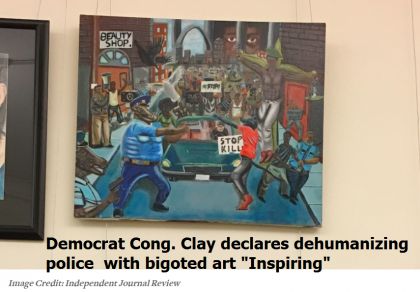 Even Rep Clay may take down the bigoted anti police propaganda he put up at the Capitol. Probably by the time just 100,000 Americans sign the Anti-Bigotry Pledge, the petition to the Democratic Party that they will never vote Democrat for the next 20 years that will do the trick, Democrats will end their hate campaign and many police can be saved from murder and the division and paranoia generated by Democrats can start to heal. Think of it, just 100,000 Americans can end this hate campaign. Who should organize it is the police themselves. 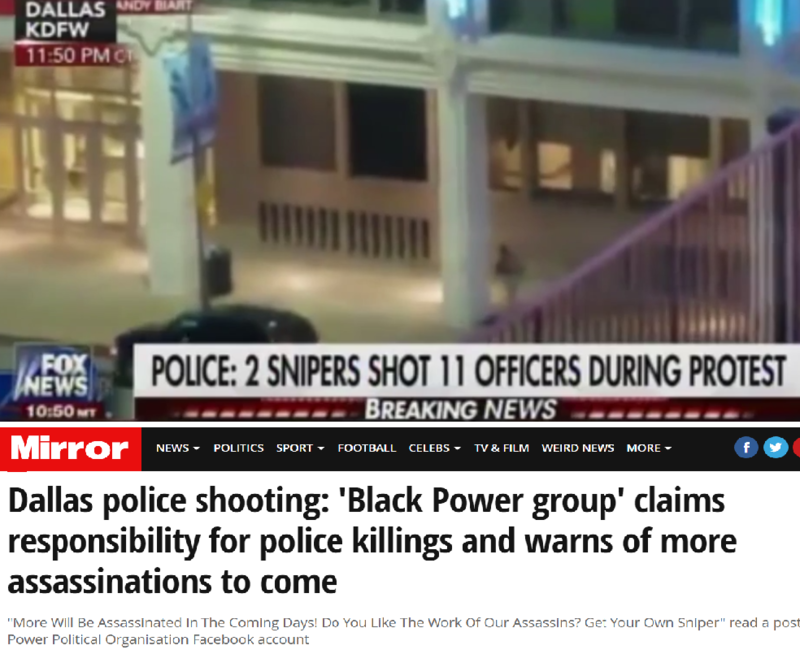 In case anyone reading this thinks the police are really overwhelming targeting blacks for murder, read the above link that proves it is a lie. The author of this article belongs to the minority group that is by far the most targeted group for police polices. Even though I am a minority my group is targeted for 93% of all police shooting and my minority group also makes up almost everyone who is put into prison. So are the police really targeting me? No my minority group is about 93% more violent and criminal that the rest of the population. What is my minority group? I am a man, and men are shot 93% of the time in police shootings. I am not being targeted the police are doing the right thing is shooting so many men. They would wrong to shoot women 51% of the time. That would require that about 90% of the women they would have to shoot to be completely innocent. This is not rocket science too figure out that the reason that men, people an their 20s, blacks, and gang members are shot by police more than women in their 70s are, it is directly proportional to the crime rates of the groups. Older PostArctic Sea Ice Is The Same Thickness?